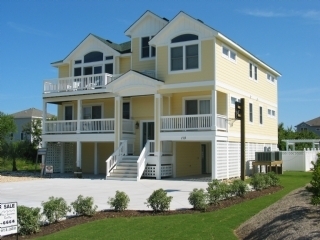 This spacious Oceanside Outer Banks vacation home provides all of the amenities needed to ensure a relaxing vacation. Conveniently located in the town of Duck and within walking distance to all the downtown attractions, this home offers many luxurious appointments and ocean views. Pool can be heated between May 1st and October 29th for an additional fee of $300. Please Note: This home will not allow pets for the 2014 rental season. Level 1: Large rec room with seating area, TV/DVD, stereo system, pool table, full bar with fridge and icemaker; half bath also accessible from the pool area; outside listen to your favorite music while enjoying the heated pool and hot tub along with a poolside Tiki bar; Ride the elevator to the upper floors. Level 2: Master Bedroom (King) with TV & deck access; Master Bedroom (King) with deck access and TV/DVD; Master Bedroom (Queen) with TV & private deck; Master Bedroom (2 Duos) with private deck access & TV/DVD; laundry room. Level 3: Master Bedroom (King) with deck access; Master Bedroom (King) with three foot doorways; great room with TV/DVD, stereo surround sound, gas fireplace; half bath; kitchen with 2 cook tops and 2 dishwashers; dining areas with seating for 14; loft sitting room with desk, wireless broadband internet connection and telephone. Taxes and fees are mot included. Distance to Beach: 1100 Ft.